The French Rhône. Napa Valley. Southwest Colorado. You know, all the famous wine regions. Okay, so maybe Southwest Colorado isn’t on the map yet — but maybe it should be. You can decide for yourself this weekend when you get a taste of the region’s wine offerings during the Mesa Verde Country Food, Wine and Art Festival, Aug. 23-25, in Cortez, Colorado — just 45 miles west of Durango on U.S. Highway 160. 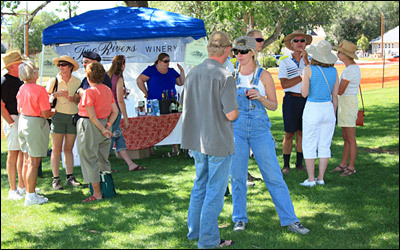 Get your sip on this weekend at the Mesa Verde Country Food, Art & Wine Festival in Cortez, Colorado. The wine weekend exclusively features Colorado wineries — about 10 total — including DeBeque Canyon Winery in Palisade, Denver-based Kingman Winery and Grand Junction’s Whitewater Hill Vineyards and Winery. The festival officially kicks off Friday night with a winemaker’s dinner at Nero’s Restaurant and Mediterranean Grill in Cortez, but tickets are $75 per person and seating is limited. Saturday and Sunday are a bit more accessible to the public. From noon to 5 p.m. Saturday at Cortez City Park, the festival will feature booths and tastings from participating Colorado wineries as well as vendors selling art, jewelry, clothes and artisanal foods such as olive oils, breads and chocolates. Tickets are $20 in advance or $25 at the gate and include a commemorative wine glass and tote. Advance tickets are available at Liquid Assets and West Slope Liquors in Cortez and at The Wine Merchant in Durango. On Sunday, head over to Guy Drew Vineyards in Cortez for an open house from noon to 5 p.m.
Be sure to book your room at the Durango Quality Inn for your wine-tasting (or wine-soaked) weekend!